I'm finally done with Mass Effect 3. I've been reading all sorts of reactions about it since the day it came out, but I wanted to finish it myself before passing judgement. First let me say the ending wasn't absolutely horrible. The game itself was great. I loved how 3 games worth of content slowly came together in interesting ways. The combat, dialogue, and general flow of the game were all improved. I had a great time through the first 60 hours of gameplay. Only the last 10 minutes let me down. 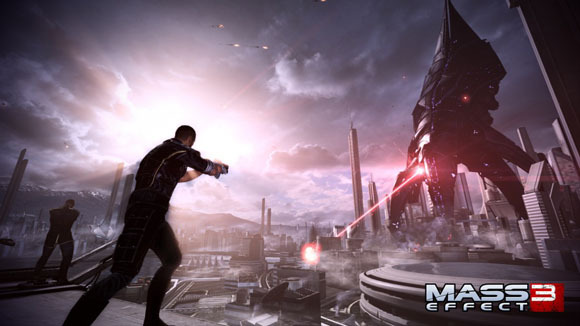 If you've played Mass Effect 1 and 2 then you should definitely play Mass Effect 3. I also dabbled in multiplayer but wasn't too impressed. I play Mass Effect for the single player campaign. The 3rd person shooting is satisfactory, but if I wanted to play a multiplayer shooter I have about 10 other games that are better suited to the task. Single player is where the strength of this series lies. I was also really sad to see the "galactic readiness" tied into how much multiplayer I played. I completed 100% of the missions and side objectives in the single player game, but because I didn't play much multiplayer my galaxy still wasn't very "ready." Sigh. I wish they wouldn't have done that. Anyway, onto the ending. Minor Spoilers ahead. I won't expound too much on what has already been written by others. I just wanted to say that the last 10 minutes of the game were ok, but they had the potential to be so much more. All of my choices across 150+ hours of play could have been used to create a custom set of end cutscenes just for me. But that didn't happen. Instead Bioware chose to go the route of giving me 3 choices totally disconnected from the rest of the series. This is even more disheartening when you consider that Chrono Trigger, a game made in 1995, has 13 distinct endings with many sub-ending variations. For some in depth analysis of the ME3 ending read this well written article by Doyce. Overall the game was good but I was disappointed with the wasted potential at the end. The final scene could have been so much more... sadly, it wasn't.